This thread is to try and help to consolidate the effort to map out the Ascent Galaxy and to help with exploration and navigation. There are a lot of threads here on the forums that have pieces of information and local systems data. There is also a lot of data listed on the wiki and at ascentextras.com. There are also players continuously exploring and collecting information in the game. I will attempt to collect what I can in the future and post it here in a viewable form as maps of our galaxy. 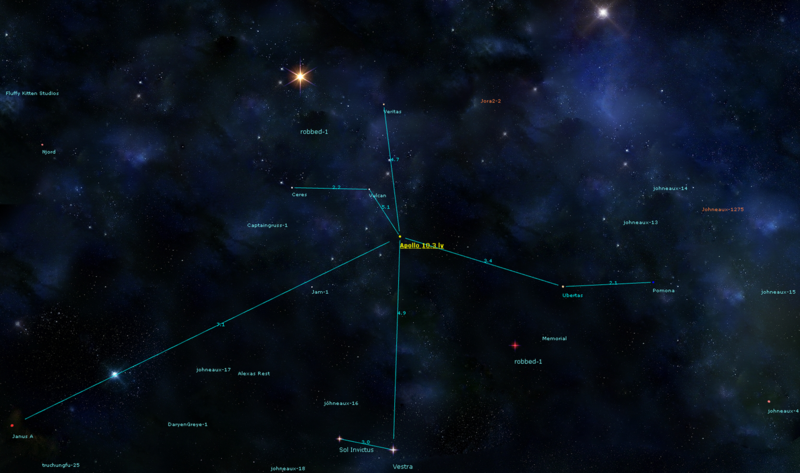 I am currently using a program called Astrosynthesis for mapping. There are also several others available...some for free...some not. I will collect information about these resources and post them in this thread for any future players that would like to do some mapping and charting. I would also ask that any who have information on star mapping programs please post it. Last edited by gotpurplefleas on Thu Jul 12, 2018 2:31 pm, edited 11 times in total. Here is one without routes from 20lyrs out. I will update this as it fills in. 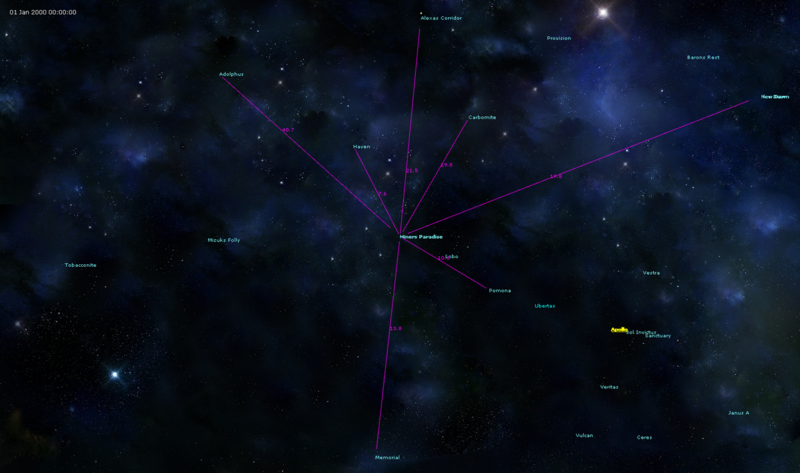 Please note that all systems within this range are not showing on this image. I filter many by distance to keep the image as uncluttered as possible. If you would like to see any system not showing within this range let me know and I'll add it. Last edited by gotpurplefleas on Fri Apr 05, 2019 12:32 pm, edited 10 times in total. Last edited by gotpurplefleas on Thu Jul 12, 2018 2:33 pm, edited 5 times in total. I really like this. I love the fact it shows the distance for each gate. I just finished a Prime gate map...if anyone would like larger res images let me know. Sorry, but the text is too small and blurred for me. I have difficulty making out the text. Here is a pic of the edges I have re-plotted so far. I will update this as more is filled in. 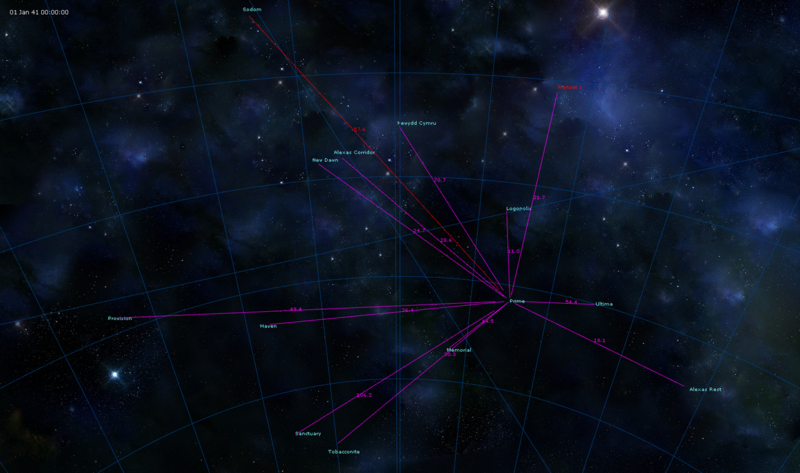 The green lines are the axes definitions with edge locations confirmed. The blue line is running off the axis and is not a confirmed edge. It is showing the last confirmed location toward the edge and is thought to be glitching and adding to the galaxy each time the next sector is accessed in the map. I also still need to find the positive Y edge location and plot it. It is a confirmed edge but I have misplaced the data. This map will change a lot as I re-enter information. Please check back frequently to see it. Last edited by gotpurplefleas on Sun Apr 22, 2018 1:53 pm, edited 4 times in total. Last edited by gotpurplefleas on Sat Apr 21, 2018 2:09 pm, edited 1 time in total. Last edited by gotpurplefleas on Tue Apr 24, 2018 1:40 pm, edited 1 time in total.